Anzan and Seishin still eating looked around upon hearing footsteps behind them, Eve may have thought she'd been quiet but Anzan had heard her. His hearing had been improved a little as part of his training at lock-picking to hear the tumblers moving in a door whilst he works "Oh hey guys" he said, Seishin following up with "How was your training?" genuinely curious at to whether Eve and Deramoto's was as strenuous as their own. Even if Seishin's training was more draining spiritually and emotionally than Anzan's physically draining training. They continued to eat their food whilst listening intently to the others talk. Eve finished off her food, somewhat put out that she'd been noticed; as a Hunter, she ought to have been more stealthy. Wiping off her hands, she turned to Seishin. "Uhm, interesting." She offered, since Deramoto didn't. She had meant it though; Hunter training had been quite interesting, if trekking through forests was their thing. That aside, they required a place to stay in now that they were out of the Guild, without any place to return to for the night. "Hey, have you checked out the place where trainees can stay, yet?" Asking no one in particular, she spoke out loud, generally looking away from the group. Eve had been caught, which wasn't all that surprising, she, who had a fraction of training in stealth, was trying to sneak onto someone who had possibly completely trained in stealth. He continued eating, just simply listening to the conversation, and then Eve asked if anyone had checked out a place for them to stay, he knows he didn't, even if they were allowed to leave, he never did, he stayed inside the building the whole time, "nope" he said. Anzan was intrigued by Eve's description of their training but decided to let it pass as he finished his kebab and she brought up the question of accommodation. Seishin thought for a second before replying with "Well I've not checked it out and... the only thing I heard of it was from... the kebab salesman before our training... and my teacher after it" Anzan nodding in agreement "That's about the same amount as what I've heard to be honest but I guess if we're all done we could go check it out now" smiling at his party of friends before saying "Just strange we haven't seen any of the others in a while" referring to Law and Jonathon; both him and Seishin being visibly confused. Eve looked up and down the streets; indeed, as Anzan said, no sign of Law and Jonathan. Had they decided to join another group? Two Hunters, a Priest, and a Thief was where their party currently stood at. They required a Warrior; one of the classes no party could do without. She sighed lightly and turned again. "We best check the accommodation first. We can return here to see if either of them are here." Either way, she wondered if they were heading out for their first attempt on the same day itself; they could easily start tomorrow as well, right? In that case, they could wait here indefinitely for the two to return. Law and Jonathon were both missing, as odd as it is, he was sure they would run into them at another time "Let's worry about them after we find a place to stay" he said. He wondered where it was that was cheap for them to stay, seeing as their money was running out quicker than he expected, of course most of did go to the guild "we also need to start earning money now as well, we don't know how long it'll last." Anzan and Seishin both nodded practically in tandem as the others spoke sense "Yeah you're right, so then Eve you've got the map lead the way" Anzan beamed happy to follow and know when others were better suited for things; heck thus far Eve had probably been the best information gatherer for the party; and it was something Anzan was seriously thankful for. Seishin then smiled and nodded "Agreed I do wonder what happened to them but as you say I'm sure we'll meet up with them again soon" happy to go with the others on the plan of action. Anzan then looked at Deramoto "You know what you're right man, I guess starting tomorrow we can give this hunting thing a go and do some actual soldier work, even if I am our only front-line man right now, We'll just have to pick our battles carefully, strike fast and take them down before the battle gets too physical" trying to speak some form of sense knowing that if there was any prolonged physical confrontation their current group make-up probably wouldn't last too long as they had two ranged attackers, a healer and him as their only real attacker as far as up-close-and-personal was considered and he knew that despite his skills he probably wouldn't do any real damage unless he could hit a critical spot on his enemy. Eve nodded at Anzan, and consulting the map for a minute, turned and walked down a lane. True enough, she dimly remembered it was three lanes past Tenbourou Tower, over a bridge. It was a poorly situated, run-down building - at least the low rent was justified. Some exploring revealed that two forms of rooms were available, one with four beds, and another with six. Eve glanced at the map again before putting it away. "The rent for both rooms is 10 copper, but the beds in the four ones are small already. I doubt even I'd fit in the six ones. These rooms are pretty dingy, badly lit," She scrunched up her face in disgust at the room, "And I doubt any of us will be spending any time here except for sleeping. Some distance away, there's another lodging only for females..." She trailed off. That lodging was a fair bit more expensive, and she couldn't afford to spend heavily now. Besides, it meant that she alone would be staying away from the group, not that there was much to stay away from. "How much does it cost?" Deramoto asked "I could help with you staying there if you'd like" somewhere, he is sure he's heard of something along the terms of 'Girls need their privacy' and as much as it helps her, it would be one less person in the room he'll be resting, and he enjoys less people. "Also, if we can't find Jonathon and Law, we may need to find more people before we go out if we can" he stated, he wasn't thinking mercenaries exactly since that would involve paying them, but someone willing to just join for a day or two. Anzan listened as the others discussed the accommodation before piping up and saying "You know Deramoto's right if you wanna stay at the female lodging I'd also chip in we're a party you know, we look out for each other, plus me, Seishin and Deramoto will be fine over here" he smiled looking at them both. Seishin also nodded "As would I.. it shouldn't be all that expensive for you if we all chip in" Anzan really felt a togetherness in the group at that moment before hearing what Deramoto said about potentially getting in some temporary people "I guess we could, I mean we'll just have to do what we'd do with Jonathon and Law and split the money the same way heck it wouldn't really be too difficult I guess and hopefully we'll run into them soon" Anzan felt that Deramoto actually knew what he was talking about, if this place was as dangerous as he'd heard then they didn't wanna risk dying on the first hunt. Eve hesitated for a moment; everyone seemed quite insistent she get the exclusive lodge instead. She wasn't sure whether to be gratified or not. "Well...I can ask around..." Her efforts were in vain. "Remember when the Dory's Kebab guy said you can find lodging around here for 50-60 coppers? The fact that this is exclusively women makes this slightly more expensive than that," She said, trying hard to keep her tone neutral. She didn't feel particularly crestfallen, but she wasn't sure how the three would take it. "Well, I guess when we actually get that kind of money, then we can pitch in for you to stay there" he said knowing that Eve was now going to be stuck with them instead "Alright then, let's get to finding that place then, I'm actually pretty tired so some rest would be nice"
Anzan nodded "Yeah agreed we should probably sort out funds first but still this should be fun" Anzan was quite happy with the group decision they'd made and though Deramoto said he was tired and sounded it he himself wasn't tired in the slightest, he figured he'd just shove his stuff; what little he had; in the room when he got there then, go find something else to do. Seishin was also pleased with the decision "Let's go get the rent sorted then, should we? Then we can get some sleep ready for tomorrow" starting to head in the direction of the accommodation with the group. "Right, then," Making her way back down the streets, Eve found herself deep in thought again, but every time she realized she was in a stupor state and broke out of it, she could never remember what she was thinking about. Was it her past? The tantalizing bubble that drifted close and disappeared beneath the surface every time she reached for it. 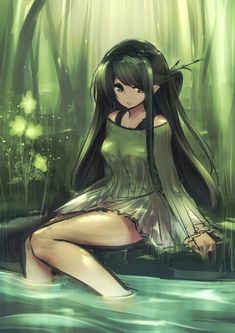 She paused, facing the stream that passed through the town, sighing lightly before continuing. This time, in better awareness, she looked around for the cat she'd encountered a week ago. Pity, it was nowhere to be seen. That was good; it had a place to call home. The rounded a corner, and the lodging came into view. Trying not to flinch, she peeked into a couple of rooms to determine their size before turning to the three. "So...four beds or six? If we get more people in the group, they're gonna have to stay with us here too." She paused for a moment. "Um...are we...taking only one room?" Camping out in the open, or sleeping in the streets was a possibility too, but that was something best left as a last resort. Besides, things like plumbing and bath houses made a big difference. Deramoto kept silent on this decision, as either answer was perfectly okay, the four bed one was probably cheaper and there wasn't a complete answer if they would get new people, maybe who weren't already staying at a lodge. The six bed was probably more expensive, but if they did get new members that didn't have lodging, then it'd be a waste having to get a new room for them. There was definite answer in which is better considering the outcome is all dependent on the future. Anzan noticed Deramoto's silence but figured he was just letting someone else take the reins for once which was understandable he then spoke up "Well I guess we could get one 6 bedroom for me, Deramoto, Seishin and maybe even Jonathon and Law when they resurface and if you want some privacy we could chip in and get you a 4 bed room that you could share with any potential girls who may join at least until we afford to help you get to the girls lodgings" he smiled, Seishin nodded in happy agreement with the way that Anzan explained his reasoning, "You said the rent for both rooms was 10 coppers each right? So... 20 for both and... 5 each? I can go with that" Seishin remarked, remembering what Eve had said earlier. Anzan and Seishin both took 5 coppers each from their pouch and held them out towards Eve, Anzan saying "It makes sense for one person to make the booking and well you've kinda been good with the locals round here, even if I don't overly trust them so, would you mind making the bookings Eve?" he figured it made sense as she'd handled majority of the locals since their arrival and was kinda likable for these people possibly more so than even his own friendly self. "H-Huh?" Eve hesitated as she was offered money and a room of her own. While she'd admit she hadn't really thought of sharing a room with them, them paying for her lodging was a bit much. "W-Wait. You're paying for a room that I'm renting. It's only natural that I pay for it." Once again, she was unsure whether she should be offended or flattered. She hesitated again before accepting the 10 coppers. It would pay the rent for the boy's room, and she'd dish out 10 for her own. Already her hand slid in her pocket to count out 10 coppers. She looked around for someone to pay to; she wasn't the most social one, and she wondered how and why she became the party diplomat. Walking towards the gate, she hoped she'd find a counter there. Eve had ran off to go pay for the rooms while he currently held 5 coppers in his hands, he was going to help pay, but now he just puts the money back in his pouch. He walked into the room and looked at the beds, they were bunk beds with hay for cushioning. He walked to a bed to the farthest right of the room and placed his weapons under it, he then climbed onto the bottom bunk and laid there facing the wall. Having paid, Eve walked back to take a peek at the room. Deramoto was already making himself at home, but..."This room is awfully small, isn't it?" Was it really fair for her to squander space and have an entire room for herself, when the others were kinda cramped in this kind of space? She sighed; the sun was still high in the sky, and she had a town to explore. Knowing her terrain would give her an advantage. It was getting hot, and she opened her hair to tie it up. "Do any of you have a comb?" Anzan and Seishin entered the room next having helped pay and began to look around and observe the space to find how they could most efficiently fit in, Seishin slowly moved over to the bunk bed in the farthest left of the room laying on the bottom bunk as that was most comfortable for him personally. Anzan also moved to the farthest left of the room climbing up onto the top bunk, almost springing up there in a singular and clear movement; figuring he'd stay close to Seishin who he somewhat felt closest to within the party. Anzan then sat there for a second just running through the events of everything that had happened since his arrival in this place and rested upon the conclusion, that it was over a week later and still he was none the wiser as to what they were doing there or how. Seishin put his staff underneath his bed, a plus side to having the bottom bunk and decided he'd rest up ready for whatever may happen the next day if they were really to go out on their first hunt as a group. Anzan meanwhile swung his legs round over the side of the bed and dropped down onto the balls of his feet, as he rose he headed towards the door of the room silently and left; his dagger in his sheath on the back of his belt. He decided that Deramoto was right without some more numbers in their group, their chances of surviving the hunt were pretty slim thus, he'd go and grab a drink at the tavern and maybe recruit some temporary party members in the process. He knew that they would have to share in the rewards from the hunt thereby the money would be split six ways between Anzan, Seishin, Eve, Deramoto and the two members he'd seek to recruit; knowing they needed a Warrior at least to join him on the front line and either a Mage or Dark Knight. He then made his way out of the lodgings building; quietly lost in his thoughts of whom he may meet that could potentially be of use. On the way to the tavern he'd heard of, he took a break sitting on the wall of a bridge and looking up at the moon, which shimmered upon the seemingly mystical waters below feeling somewhat at ease for what may be one of the first times since his arrival and calmly took in a breath of the fresh local air. Deramoto watched the two from the corner of his eye, seeing the two choose the bed on the other side of the room, which he was happy with. He went back to staring at the wall thinking, he was entirely annoyed by what's been going on this... life? He wasn't sure anymore, he doesn't remember anything before waking up in the strange tower like building. He made a quiet sigh to himself and closed his eyes, he simply laid there, listening to the outside from inside the room. Eve was nonplussed when her question was unanswered. No matter, she'd make do with finger combing for now. Quickly tying up her hair, she followed Anzan to the front door, where they split ways. Walking in the opposite direction, she aimed towards the fringes of the city. The only place she knew had a stash of books was the Headquarters, but that creep would also be there. Hence she had to find a library of sorts. She wasn't keen on socializing, and books would provide her with more reliable information. Night fell as Anzan entered the tavern having finally found the place through the sounds of drunken singing, he slowly made his way to the bar looking around a few others giving him strange looks which he was unsure of why but shrugged off, marking it down as the fact he's the new guy to town. He wondered how often people just turned up like him and his new found friends and decided that he'd have to ask someone that hopefully find something out for once knowing a lot of the time it's Eve who gathers answers. Upon reaching the bar he asked "Can I get a beer?" smiling at the bartender who was pretty but he wasn't interested in anything like that he just wanted to do what he had to here and find out why "So you work here for a while then?" He asked putting on the charm offensive to hopefully wrangle some information from her. Meanwhile Seishin had fell asleep back at the room blissfully unaware of the world, at peace with himself despite the uncomfortable bed. Deramoto got out of the bed and noticed Seishin fell asleep, so he went outside to lay in the grass instead. It had become night in his time of thought it seemed, but it wasn't new to him to get lost in thought when nothing else was going, at least he hoped it wasn't. He watched the stars and the red moon, something told that wasn't normal, but how could he know, he doesn't remember it being anything else. He was irritated by this, how could he not remember anything before his current 'life', he kept all of this inside as he laid there. Despite her Hunter training, Eve was unprepared for the slew of knowledge she'd gained about their potential enemies. Goblins, Kobolds, Orcs, Wolves... The list was practically endless. This was a much more diverse world than she'd thought, and they'd have to seriously struggle to just survive. Walking back in contemplative silence, she passed a structure that was much too loud for her liking. A tavern? Bar? Something? Whatever. She would have passed by without a second glance, but paused for a moment. Was that Anzan in there? She leaned against a building for a moment, letting her system clear, and expel the foreign substance. Pressing against the stone wall, she slid to the ground, eyes closing, as her breathing evened, and even deepened, allowing her to take deep gulps of the cool night air. What was this world? Why was she here? She could feel tears pooling in her eyes, and wondered if she would have done if before coming here, would someone have comforted her? Did she know what an affectionate gesture felt like? Her hand rested against her leg, and her grip tightened; she wanted to go home. Rivulets of silent tears began flowing from her closed eyes.